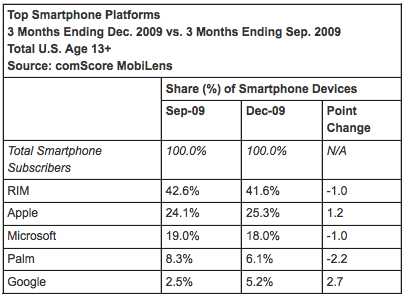 The top smartphone maker RIM came in fifth place —behind LG, Samsung and Nokia —with a 7 percent market share. While the BlackBerry maker lost ground in the smartphone market, it gained in the overall cell phone market, boosting its presence by 0.6 percent and closing the gap with fourth-place Nokia, which dropped 0.4 percent to 9.2 percentage points. The study also found that most mobile phone users —63.1 percent —use their handset to send text messages. In addition, 27.5 percent use a Web browser, 21.6 percent play games, 17.8 percent download applications, and 12.1 percent listen to music.